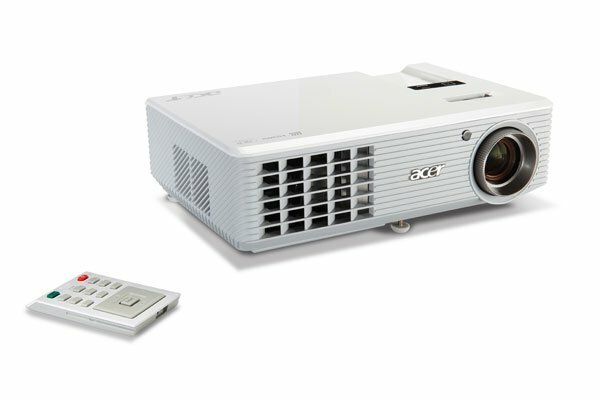 Acer has launched a pair of new video projectors which are capable of displaying 3D video, the Acer HS5360 and the Acer X121, both models feature NVIDIA’s 3D Vision Ready technology. First up is the Acer H5360 which features a 1280 x 720 pixel resolution, meaning it can display HD video in 720p. It features an illumination of up to 2500 ANSI lumen’s and a 3200:1 contrast ratio. The Acer H5360 features one HDMI port, three RCA jacks, component video, S-video mini DIN, a 2.5mm audio mini jack and a 15 pin D-Dub connection so you can hook it up to a PC. Next up is the Acer X1261 which features a native XGA resolution and a 4:3 aspect ratio, with an illumination of up to 2500 ANSI lumen’s, a 3700:1 contrast ratio and a vertical refresh rate of 50-120Hz. The Acer X1261 can also be adjusted to a 16:9 aspect ratio for video content and it comes with a range of inputs which include composite video, S-video mini DIN, and a stereo mini audio jack. Both of these new projectors are available now, with the Acer X1261 retailing for $579, whilst the Acer H5360 will retail for $699.